For several weeks, we’ve been eating lettuce and Bok Choi or Pak Choi Chinese cabbage out of our garden. It has been very nice to not have to buy lettuce and cabbage at the grocery store and we are enjoying the incredible freshness it provides as well. I’m also enjoying the savings the lettuce and cabbage is providing! It’s making me very anxious about gathering other garden goods! We’ve been using the lettuce on our lunch sandwiches as well as usually preparing a large salad in the evenings to go along with supper. 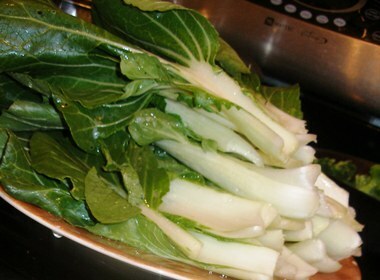 In addition, the family loves the Pak Choi cabbage. This Chinese cabbage has a very mild flavor and is so nutrient dense it practically bleeds chlorophyll when it is cut. I’ve been preparing the chinese cabbage by washing it really well and then chopping it up and then putting it into a stir fry that the kids even ask for seconds and thirds on. I’ve varied the stir-fry by adding different vegetables to it each time. 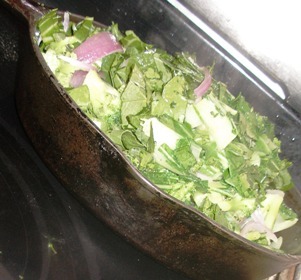 Last night, I added sliced purple onions, minced garlic and cut broccoli along with chopped Pak choi. I added salt and pepper and just a bit of Braggs (or you could add a bit of soy sauce). We have been snapping the leaves off the plants, and allowing the plants to continue to produce. I’m looking forward to creating a bunch of side dishes out of this Chinese cabbage now that it is taking off! I would have never bought bokchoy or pak choi from the grocery store, but now that I have it growing in the garden, I’m learning to use it and have found that we love it!